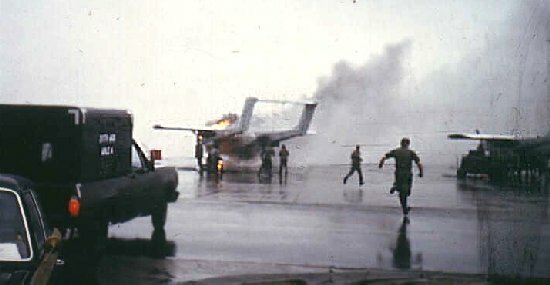 OV-10a on fire. The aircraft fire was caused when the engine chip light came on and caused a severe engine failure. The engine failure caused an explosion, with metal hitting one of the engine mechanics in several places. The mechanic was transported to Landstuhl Army Hospital.. Picture supplied by Gary Price, Circa 1980.